Emprise Corporation announced today that they have delivered the first unit of a new line of fuel/water separator test stands. This latest product marketed under the “Testand” brand is capable of performing SAE J1488, SAE J1839, and ISO 16332 test procedures. In a remarkable accomplishment, the new design performs these tests automatically and unattended. The key to this capability is a “patent pending” automatic sampling, sonication and titrating system of impressive accuracy and repeatability. “After the test is setup, you can go to lunch and expect the complete report to be available when you return”, observed Emprise President Ron DuBose. “The customer is very happy with the functionality and performance of the system and considers it the “Taj Mahal” of their test lab”. The first unit was placed in production service on March 1, 2012 following an exhaustive acceptance test program. Emprise is looking forward to introducing this advanced product to the fuel/water separator arena. For more information about this revolutionary new filter test system please click here. Emprise Corporation announces the addition of a Multi-Spec Fuel/Water Separator Test Bench to its Testand product line of filter test equipment. Significant changes in global diesel emissions standards and the increased use of biodiesel fuels have placed greater demands on fuel/water separators. These developments in the diesel industry have resulted in proposed revisions to both the SAE and ISO test procedures for fuel/water separators. Emprise is the first to offer a single test bench that meets all of the requirements of SAE J1488 (proposed draft 2004-08), SAE J1839 (proposed draft 2008-06) and ISO/CD 16332 (2nd edition 2009-05-15). “This test bench will allow filter manufacturers to start testing their new fuel/water separator products to all three of the new standards”, said Ron DuBose, President of Emprise. “Those manufacturers will have a distinct advantage; allowing them to bring separator products that meet the new specifications to market ahead of their competitors.” Emprise acquired Testand Corporation (formerly located in Pawtucket, Rhode Island), in 2008 to expand their product offerings to the automotive and heavy duty filter markets. Since acquiring Testand, Emprise has been working to update the Testand product line to meet the needs of the current filter industry. Emprise is a licensed engineering consulting firm in its 30th year of serving the automotive, aerospace and power industries. Engineers at Emprise design all types of custom test equipment and facilities ranging from test benches to complete turnkey construction projects. With annual sales exceeding 7 million, Emprise is an engineering consulting firm with over 27 years of experience in the turnkey delivery of automotive, aerospace, industrial and alternate power test stands and facilities. 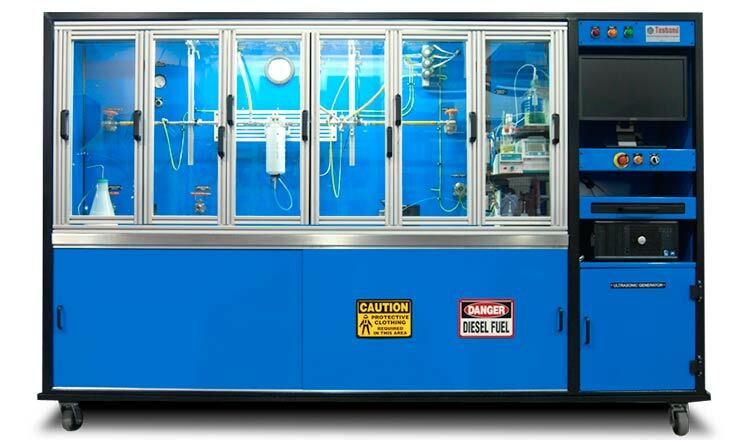 As turnkey engineers, Emprise designs and builds custom test facilities and equipment to suit almost any application. Emprise’s licensed engineers also provide design services and construction management.